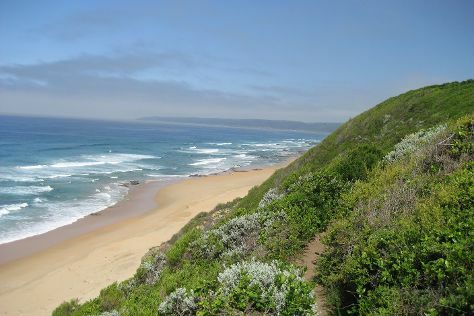 You'll get in some beach time at Brenton on Sea and Buffalo Bay. 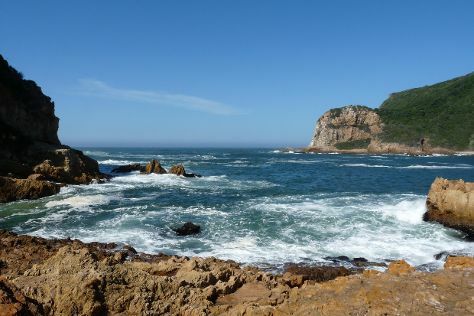 Visiting Knysna Heads and Robberg Nature Reserve will get you outdoors. There's more to do: stroll through Knysna Elephant Park. For traveler tips, maps, reviews, and more tourist information, use the Plettenberg Bay itinerary maker. Mumbai (Bombay), India to Plettenberg Bay is an approximately 21-hour flight. The time zone difference when traveling from Mumbai (Bombay) to Plettenberg Bay is minus 3 hours. When traveling from Mumbai (Bombay) in August, plan for slightly colder days in Plettenberg Bay, with highs around 22°C, while nights are cooler with lows around 13°C. Finish up your sightseeing early on the 19th (Sat) so you can go by car to Wilderness. On the 19th (Sat), have fun at Acrobranch Wildwoods and then kick back and relax at Wilderness Beach. To find other places to visit, more things to do, ratings, and other tourist information, read Wilderness sightseeing planner. Traveling by car from Plettenberg Bay to Wilderness takes 1.5 hours. Alternatively, you can take a bus. Traveling from Plettenberg Bay in August, plan for a bit cooler nights in Wilderness, with lows around 9°C. Cap off your sightseeing on the 19th (Sat) early enough to travel back home.